FOR supporters Stevie Kilcoyne, Father Frank Dougan, Paul Wiggins and Gordon McHugh, the completion of their gruelling 96-mile trek from Milngavie to Fort William not only marked a wonderful personal success for each of them, it was also the culmination of an immense fundraising effort from the group. Through their hard work, commitment and determination, the quartet have raised a phenomenal total in the region of £60,000, which will be shared equally between Celtic FC foundation and Kilbryde Hospice. Having begun their five-day challenge on September 20, Storm Ali, which had been causing havoc earlier in the week, had thankfully subsided. The group were instead blessed with good, dry weather as they kicked off their walk, although they did have to contend with some of the debris left from the storm on their route. Over the course of the five-day trek, they walked an average of almost 20 miles per day, taking in some truly breath-taking sights on the way such as Beinglas Farm, the Bridge of Orchy and Rannoch Moor. On day three, the group were paid a welcome visit from Celtic FC Foundation Chief Executive, Tony Hamilton, as he joined them for breakfast in Crianlarich. After a quick catch-up, it was back at it for Stevie, Father Frank, Paul and Gordon, as they continued their progress, despite some heavy legs. After an incredibly challenging five days, and with plenty of aches and pains, the fantastic four finally arrived in Fort William on September 24, where they were provided complimentary access to the shower facilities, as well as a well-earned complimentary lunch at the Nevis Centre. Upon completion of the challenge, the group were quick to express their thanks to everyone who supported them along the way, from generous donations, to simple acts of kindness to help make the journey more comfortable. Tony Hamilton added: “The effort that this group has made in not only taking on this challenge, but also in raising funds for the two charities has been truly outstanding. “I had the pleasure of spending a short time with them during their walk and I have huge admiration for what they managed to achieve. West Highland Celtic Way walker and Kilbryde Hospice CEO, Gordon McHugh said: “It was nothing short of an honour to walk with three very special people. It was certainly a challenge but a fantastic experience, however, the camaraderie and prayers got us through each day. 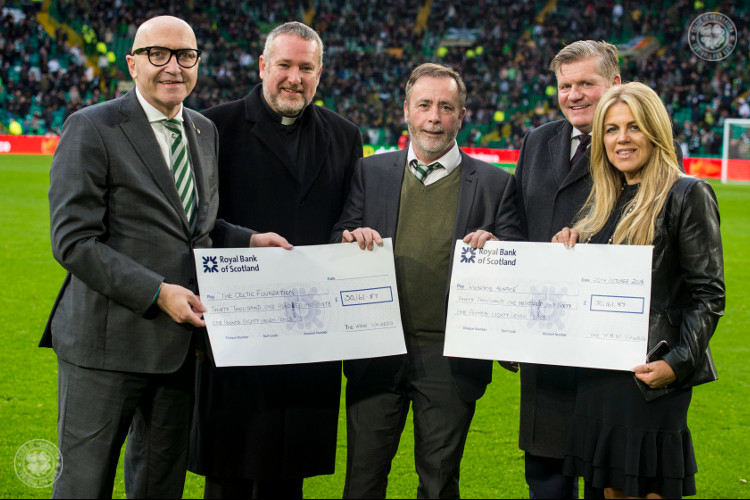 The group were delighted to attend Celtic’s recent game against Hibernian on October 20, and were invited on to the pitch at half-time to present cheques to both charities.